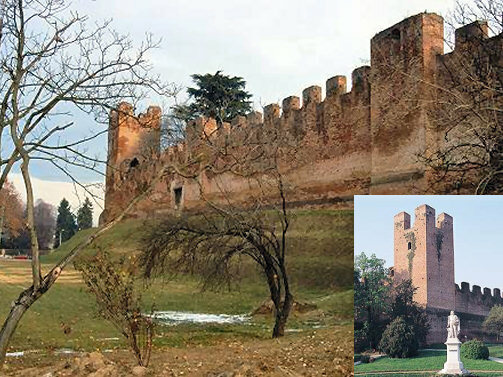 Castelfranco was founded in 1199 by the town of Treviso and was meant to be a bulwark against the town of Padova. This charming medieval town just 40 minutes northeast of Vicenza is surrounded by medieval walls enclosing the remains of a 12th century castle. In 1477 it became the birthplace of the famous Italian painter Giorgio Barbarelli, better known as Giorgione. Within the 18th-century cathedral of Castelfranco are not only frescos by Paolo Veronese (whose art can be seen in the church at Monte Berico in Vicenza), but one of Giorgione's finest works, the "Madonna and Child with SS. Francis and Liberale." In the background of this painting the towers of the old town can be seen. Castelfranco and Cittadella make for a nice day trip from Vicenza.